Oh, hey there! It’s been a few years and some stuff has happened around here! I made another human and it was hard work, but he’s almost two and a half now and I think it probably takes about that much time to become human again. He’s got crazy curly hair, an epic side eye and has my love for salty, briny things. I’m getting him a jar of fancy green olives for Christmas, because I know he’ll really appreciate them. Basically, my food twin. We’ve done a lot of cooking and eating the last few years (and boy is my waistline solid, er soft, proof of this) and are still learning how to use food to bring us around the table as a family every day. Dinner is still a sacred place where we all gather together around a shared meal. It’s not always (rarely) glamorous which means many cold bowls of cereal topped with questionable blueberries but sometimes I pull together a quick sheet pan dinner with vegetables that everyone eats! It’s the small things in life, y’all! Whatever our meal will be, one thing is certain, it has to be quick to be successful. Between school, work and bedtime, there just isn’t much time to get dinner on the table, so I rely on quick recipes to get us to the table as fast as possible. 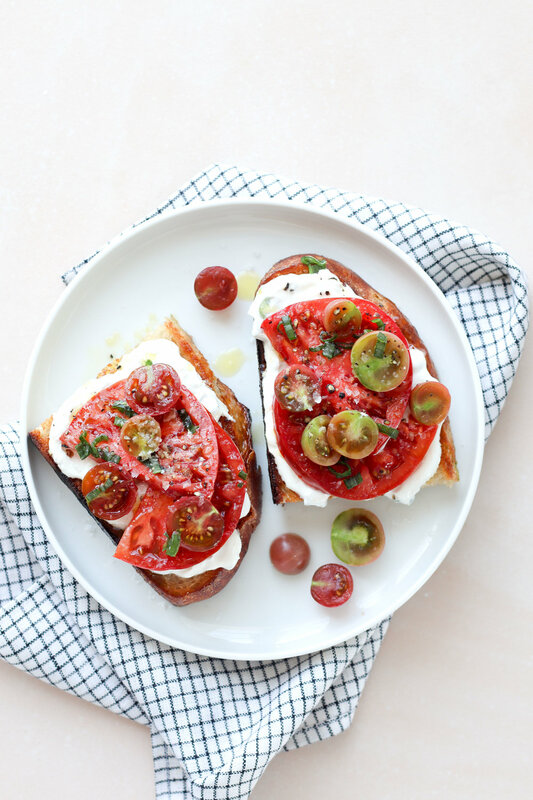 In the summer and early fall, this tomato toast is a life saver. Besides being fast, you can make it with as little effort as popping a piece of crusty bread into the toaster. I like to pan fry the bread in a skillet, because, well it’s delicious, but a toaster would be a fine substitute! A good loaf of bread and peak season tomatoes will make this dish sing. Get the best you can find! Heat a cast iron skillet over high heat. Drizzle olive oil over bread slices, on both sides. Rub the cut garlic (cut side down) over each side of the bread. Working in batches, add the bread to the hot pan, being careful not to crowd the pieces. Toast until deeply browned, about 3 minutes. Flip over and turn the heat down to medium high. Toast until well charred. Set aside. Mix together labneh, scallion and 3/4 tsp salt in a small bowl. Spoon a heaping tablespoon of scallion labneh over each slice of bread. Top with slices of heirloom tomatoes and sprinkle cherry tomatoes over. Drizzle a bit of olive oil over tomatoes and top with flaky salt and freshly ground pepper. Keeping cool in California in the summer can be a little tricky sometimes. We've had several days of over 100 degree heat and no one functions well in those circumstances. I swore off wearing shorts years ago, but in the last three days, I've been wearing them nonstop because that's the closest I can get to running around naked. This week though, the heat confronted more than just my body issues, it questioned our parenting. Last Wednesday, the weather was mildly warm, not nearly as hot as it has been this week. Our house has air conditioning, thankfully, but even then, it's hard to keep our third floor condo cool even in temperate weather. We usually turn off the A/C at night and sleep just under sheets and little clothing. That night, Ollie was wearing more clothes than we would have normally dressed him in, but since the weather hadn't been too hot, we didn't think much about it. Around 2am he woke up crying, which is not totally unusual, but he seemed pretty upset. We went into his room and he was extremely hot. We stripped him to his diaper and brought him in bed with us. We took his temp and it was slightly higher than normal and with our 2am brains, decided to just try to get him back to sleep in bed with us. He seemed like he was calm but sleepy so we all dozed off. An hour later, I woke up to him seizing next to me. He was unresponsive, pale with blue lips and I thought he was dying. We called 911 and rushed out of the house with our lifeless toddler, hoping that intervention would save him. As we waited for the ambulance, he started to come out of his comatose state, crying periodically but still totally out of it. The ambulance deemed it unnecessary for them to transport him now that he was not seizing so we took him to the emergency room ourselves. The doctors told us he had a febrile seizure from a high temperature. His little brain couldn't regulate his body temperature, thus thrusting him into convulsions. It was by far the scariest moment as a parent to date and I hope that we don't have to experience that ever again. Thankfully, Ollie seems to be no worse from the wear, although we are completely traumatized. He's basically sleeping naked for the rest of his life and I will be forever obsessive about him staying cool. Three days of over 100 degree weather has not helped my cause much this week, so we are doing what we can to keep us cool (read: setting the A/C to 65 and not leaving the house). I'm hoping after this heat wave we'll be seeing fall approaching, but you never know in the sunshine state. We could be in the 80's well into Thanksgiving. Let's all hope for the quick arrival of sweater weather. I don't know a much better way to beat the heat than with popsicles. Peaches are perfect right now, so they seemed like an obvious choice, but you can use any ripe fruit you have on hand. Apricots, pluots, plums or nectarines would be an excellent choice. Puree all ingredients with an 1/8 teaspoon salt in a blender until smooth. Pour into molds and freeze 30 minutes. Insert sticks, then freeze until firm, about 2 hours. We always start out the week with the best intentions. On Sunday night, I make a menu for the coming week and I write up a grocery list for Monday so I'm ready to do all the shopping. The process takes me (what feels like) all day. I'm easily distracted and have been known to fall down a pretty deep rabbit hole of recipe research. I'm also pretty picky. I want to make sure I have a menu I'm excited about, one that will be healthy as well as satisfying and will be tolerated by adult and toddler. It can be a little over the top and I should probably simplify my strategy, but somehow, I find joy in the long and sometimes grueling process. I generally have a meal planned for every night and I use the leftovers for lunches and carry over for other recipes. A whole roasted chicken can turn into many meals, which is helpful because that really cuts down on the prep time for following meals. Lately, I have been leaving one night free for going out or for left overs. This gives me a chance to use up any ingredients I didn't end up using. These are the nights I rely on my pantry to give the left overs new life. A well stocked pantry and a little knowledge can put dinner on the table with little effort which is especially useful when your toddler is losing every ounce of composure and he needs to have a face full of pasta at that very second. It's basically a zoo around here. Feeding yourself, let alone your family can feel like a really big job. It takes time to plan, to cook, to clean and sometimes doesn't feel worth it, especially if cooking doesn't come easy for you. Some of that stress can be eleviated by learning some simple skills. Like being able to pull out a box of pasta and have a hearty meal for your family without thinking about it. In the next couple of weeks, I'll be launching some new categories, to help you get dinner on the table faster by learning how to use your pantry, knowing what foods go together and helping you with some time saving techniques and tips. Until then, throw together a big pot of pasta and start getting a feel for the kinds of meals you can make on the fly. If you're really wanting to dive into this process further, I'll be teaching a class on September 12th where I'll be teaching you how to become a pantry wizard. It's going to be a great time! We'll learn, eat and hopefully laugh a lot. I'd love to see you there! This is a pantry recipe, so if you don't have some of the ingredients, try to see if you have a substitute already before running out the store. If you don't have corn, but you've got some peas, use those instead. If you don't have zucchini, use yellow summer squash. Take a look at what's in your fridge and use what you think will work. Experimenting is the first step toward becoming a better cook. If you're stumped, leave a comment and I'll do my best to guide you. Happy cooking! Fill a large pot 3/4 full of water. Add the kosher salt and bring to a rapid boil. Add the pasta and cook until al dente, about 8 minutes. Drain the pasta in a colander being sure to save 1/4 cup pasta water. Return the pasta to the pot and set aside. While the pasta cooks, heat the butter and olive oil over medium high heat in a large skillet until the butter is melted. Add the onion, corn and oregano with a pinch of kosher salt. Saute until the corn is almost cooked through, about 4-5 minutes. Add the zucchini, kale and garlic and cook until the kale is starting to wilt, about 3 minutes. Add the pasta to the skillet and toss well. Moisten with pasta water if the pasta starts to look a little dry, about a tablespoon at a time. Top with a generous amount of freshly grated parmesan and mix to combine. Divide among four bowls topping with extra parmesan, because, DUH, cheese. One of the things I have enjoyed the most about being home with my family for the past year and a half is our breakfasts together. Our daily schedule has become like muscle memory to us by now, always starting with a little voice in the next room babbling about choo choos or "bubbie buh" which is his word for Bubble Guppies, his favorite cartoon. Jon and I usually roll over at the first peep, hoping it's a false alarm, but when he starts kicking the wall (undoubtedly annoying our new neighbors downstairs), we jump up and rescue him from his crib. A diaper is changed, a milk smoothie is made and the french press is poured while we all settle in on the couch to watch an episode of "bubbie buh". Our apartment doesn't see much morning sun, which creates a gentle environment to ease us into the day ahead, and the coffee gives us the jolt we need to get going. After the cartoons, we switch on the news, Jon hits the shower and Ollie and I make breakfast. Usually eggs, often with greens or squash with cheese, piled on top of buttered sourdough toast. We all sit down together at the table most mornings and Oliver makes our hearts swell when he puts out his hands to remind us to pray. After thanking the Lord for His goodness to us, we eat and we laugh, mostly at Oliver and then daddy leaves for work and Ollie and I go about our day. In just a few short weeks, I'll be returning to work full time. While I have missed the working world and look forward to joining it again, this decision was a hard one to make, with the obvious consideration of my son and the life we have come to enjoy so much. It's overwhelming at times to think about all the changes we will go through and all the adjustments we will have to accommodate. Only knowing life as a stay-at-home mom, I can't quite wrap my head around what our lives will look like in a few short weeks. My hope is that we will adapt with joy and marvel at all the new opportunities we have been given, though I must be honest, today I'm feeling like I'm going to desperately miss my son. I'm hoping our breakfasts will still be a part of our morning, even if they're slightly abbreviated. These savory oats definitely could be on the menu, especially if I make a big batch on Monday morning and just reheat them the rest of the week, only needing to cook a quick egg. I love that these take a savory turn as too much sugar in the morning generally doesn't do me any favors. They're a good way to start your day and could easily carry you through to lunch. Bring water and salt to a boil and add the oats. Decrease the heat to low and cover. Cook for 5-7 minutes, stirring occasionally. Remove the pot from the heat and let it sit for two minutes. Transfer the oats to medium bowl and add the hot sauce, cumin, smoked paprika, kosher salt and fresh ground pepper. Stir to combine and cover with foil. In a clean sauce pan, bowl 4 cups of water and then reduce to a gentle simmer (you should see small bubbles coming up from the bottom, but nothing more aggressive than that). Crack an egg into a small bowl or cup. Swirl the water with a wooden spoon and slide the egg into the middle of the swirl. This allows the whites to wrap around the yolk in a little package. It may still look a little messy, but thats ok. Set a timer for 2 minutes. Remove the egg from the water with either a slotted spoon or a spider strainer. Transfer to a plate. Trim and wild bits of egg white. Repeat with remaining eggs. To plate, divide the oats among four bowls and top with an egg, onion, cilantro and a splash of hot sauce. Sprinkle with a touch of salt and pepper.